While bulk water sales haven’t been completed, three new applications show interest is still strong. Adak Island. 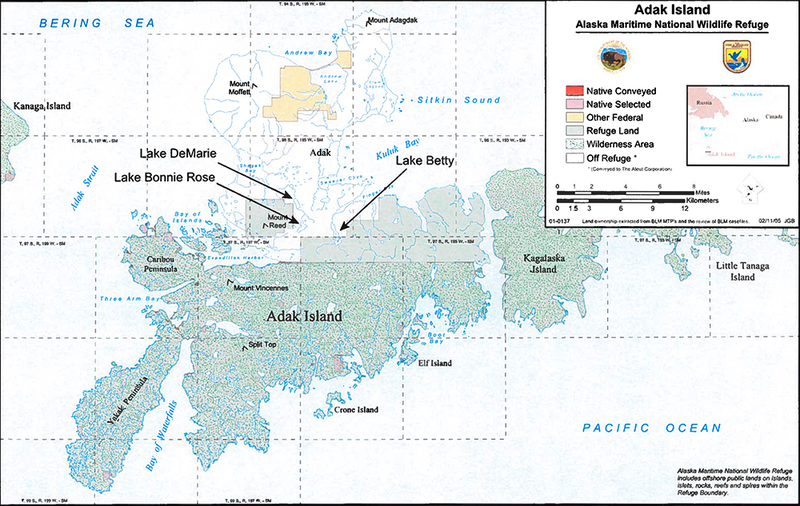 Alaska Maritime and National Wildlife Refuge. Click image to see full size. The Alaska Department of Natural Resources received three applications Tuesday from the Aleut Corporation for bulk water removal from Adak Island, according to Gary Prokosch, the state’s chief of water resources. It will take up to one year to determine if bulk removal permits will be issued, Prokosch told Circle of Blue. The ADNR will determine if the water requested is surplus water that can be used and still leave enough in the lakes and rivers for fish as well as hydrologic functions. Prokosch said the department will also evaluate future alternate uses of the water. Adak Island, located 2,000 km (1,240 mi) southwest of Anchorage on the Aleutian chain, was the site of a naval air station that closed in 1997. The Aleut Corporation, which was established as a native Alaskan-owned corporation in a 1971 federal land claims settlement, acquired the naval base property in a land swap. Fewer than 300 people live on the island, now mainly used as a fishing supply hub. Included in the deal were three reservoirs the navy used for water supply, said Tony Cange, the president of Aleut Real Estate, an Aleut Corporation subsidiary that’s handling land transactions. The company has applied for bulk water removal permits of 500,000 gallons per day for each of the three reservoirs on the former base, including lakes Betty, Bonnie Rose and DeMarie. “One of the advantages Adak has is the infrastructure for a deepwater port and a location to make the economics work,” Cange said. The corporation is in discussions with an investor from Vancouver, British Columbia about a contract for moving the water, but no agreement has been reached yet and the financial details are still being vetted, Cange told Circle of Blue. Revenue from the water sales would help fund economic development projects on the island, he added. The first time Aleut Corporation considered bulk water was in 2000, but the company subsidiary never finished the application process, Cange said. Water investors have long looked at Alaska as a potential source for global water shipments, but no company has been able to complete a bulk water sale. Many of the Alaskan proposals have focused on the southeastern city of Sitka. Alaska Resource Management LLC is negotiating to build a water bottling and distribution facility near Mumbai, India so that it can export water it has under contract from the city’s Blue Lake reservoir. Aqueous International, another company with water exporting ambitions, submitted bulk removal applications to the ADNR in June but the applications were returned because they were missing a coastal management questionnaire, Prokosch said. The chairman and majority shareholder of Aqueous, Ric Davidge, told Circle of Blue the company is continuing to do hydrological studies and does not know when or if it will submit bulk removal applications. Davidge, a former chief of Alaska water resources, has tried unsuccessfully for a decade to develop bulk water for export in places such as Humboldt County and Mendocino County in California as well as Alaska. His company has also approached Sitka about purchasing water rights. Double Choke Point: Demand for Energy Tests Water Supply and Economic Stability in China and the U.S.